4 Can Supplements Reverse Gray Hair? Accelerated hair loss is daunting, with very little prospect of reversing. It comes with unwanted social stigma, which can affect the quality of your life. To date, prevention is the best option for keeping and regenerating your hair. Among preventative measures, studies have shown the benefits of marine algae, also known as seaweed, for hair growth and maintenance. Adding seaweed to your diet may help in restoring and growing your hair. According to the Mayo Clinic, there is no one specific disorder or state that leads to hair loss. Factors such as hormonal changes, medications, poor nutrition, irritation and damage from hair treatments can all contribute to unwanted loss. On average, losing 50-100 hairs per day is considered normal. Moreover, hair grows in cycles, in states of rest and growth, but when the “rate of shedding exceeds the rate of growth,” thinning and baldness may ensue. Though seaweed consumption is fairly new to the West, seaweed has been a part of the Asian diet for centuries. Asians use seaweed in soups, salads and other dishes as a nutritious low-calorie food. In the West, the food industry has traditionally used seaweeds for their polysaccharide extractives —alginate, carrageenan and agar, according to “Trends in Food Science in Technology.” However, in recent decades, seaweed has been introduced as a major whole-food ingredient. 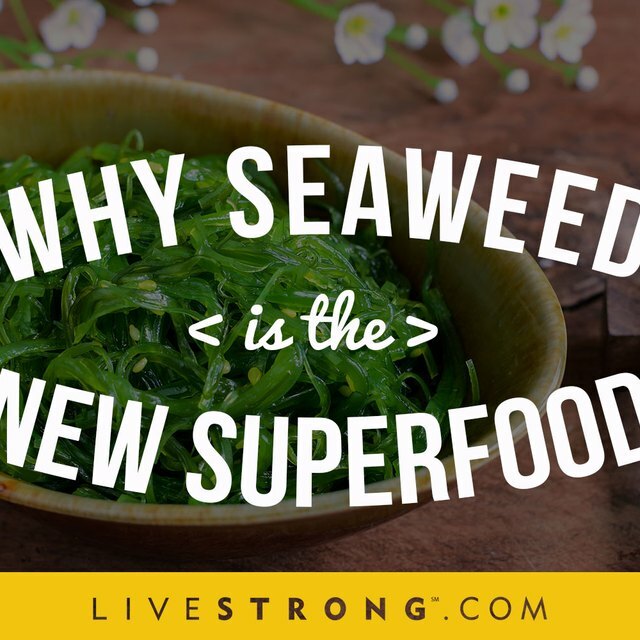 According to "Nutrition Reviews," seaweeds have higher levels of minerals such as calcium than terrestrial vegetation and contain essential fatty acids omega-3 and omega-6. Many seaweeds get direct sunlight, making them rich in antioxidants; vitamins A, B, C and E, and protective pigments. In addtion, some seaweeds, such as nori, are high in protein, while brown seaweeds contain chlorophyll for photosynthesis. Iodine, iron, phosphorous, potassium, manganese, porphyran, copper, and zinc are also found in seaweeds. Jacqueline Renfrow, author of "Health Solutions From the Sea," notes that the alginates in seaweeds have detoxifying agents that can help to eliminate toxins and heavy metals. Seaweed alone contains many of the necessary vitamins and minerals needed for hair growth. For instance, according to "Alive: Canadian Journal of Health & Nutrition," omega-3 fatty acids feed hair follicles to stimulate growth, and iron and zinc maintain hair production. Zinc deficiency leads to hair shedding. Moreover, vitamins A and C are also needed to produce sebum, which acts as a natural hair conditioner; vitamins B and E help maintain healthy hair. Calcium, rich in seaweed, is another vital mineral in hair production. Finally, detoxifying the body can promote healthier hair growth. Nori is what you find wrapped around your sushi rolls. It comes in dried square sheets. Dulse is a salty red alga and has a bark-like structure. Hijiki looks like dried dark stems, and sea lettuce is a bright green alga that looks much like terrestrial lettuce. It is known for its strong seafood taste and smell. Finally, kelp is the seaweed that typically washes up on shores and is best for raw recipes. However, all these forms are suitable in soups, salads or side-dishes. Yangok Chu has been a freelance writer and a professional writing tutor at community colleges in Southern California and Houston since 2000. She also served as a staff contributor for the online publication WhoisIsabella. She has a Bachelor of Arts in English from the University of California at Santa Barbara. Can Certain Minerals Make Hair Grow? What Is Swallow's Nest Soup?